I've been doing tow ups since 1993 - properly, lots of people have worldwide. That is with boat tow hang gliding equipment using a glider that can structurally pull more G's than most single engine non-aerobatic aircraft. That is they don't break easily unlike kites which seem to break way too easily. Even if you have a tow line break the glider is so stable it generally will fly out of it without much pilot input. I had a lockout at 300 ft. my second training flight over land, I didn't do anything even though I was pulled into a vertical attitude, the glider flew out of it. With a kite, you would likely just slam in at full speed under similar circumstances. We often start at about 1400 ft. over water and 2500 ft. over land by truck tow or 5000 ft.+ by tug. Towing up to 75 to 150 ft. with gear that might fall apart at anytime, why, minor altitude and zip margin for error? Went through USHGA certification for this 14 years ago for boat, truck and more recently for aerotow using ultralights. I bet lots of guys on here have done boat and truck tow hang gliding for a lot longer than I have. What about weak links, lockout, proper towline tensions, does anyone use this stuff with kites? What about training, flight theory, emergency procedures like is routine with hang gliding and paragliding? You don't need it? Yeah right. How many times have you had some load bearing component of kiting gear break? I have a few dozen I think since 1998, it can break commonly. 1. Broken flight line, kite spins, lift retards and you slam in. 2. Broken pigtail, kite spins, lift retards and you slam in. 3. Broken bridal, kite spins, lift retards and you slam in. 4. Broken spreader bar or harness attachment, kite spins, lift retards and you slam in. Unless your hook breaks or you accidentally unhook and let go, then see #9. 5. Corner rips from kite, kite spins, lift retards and you slam in. 6. Kite rips in two, lift vanishes and you fall like a lead balloon. 7. Broken leader, kite spins, lift retards and you slam in. 8. Leading edge plug blows out, lift retards, canopy may collapse and you guessed it. this could go on a LOT longer, I hope you see that. I have had all of these failures, some more than once. Towing too hard, whatever that is, can bring on these failures far easier than normal kiting. Weak links aren't commonly in use, nor are winch tension adjustments, just wing it I guess. OK, now think about stalling the canopy and dealing with that for a while. Are some of the new RAM air foils more durable than LEI's? You've got me. The ones I used to have, about 8, failed even easier but in fairness that was many years back. I understand that some are made by the same concerns that manufacture far more durable paraglider canopies but are they made to similar specifications? Who knows. People copy what they see. Towing up with a kite is incredibly easy, almost anyone could go through the motions initially. Now deal with an inflight emergency, say a partial or complete stall, breakage, lots of unsavory possibilities with bare seconds to the surface. The problem is the gear, harness, lines, etc. aren't designed for it, it is misuse of traction kiting gear. Be careful what you promote by example or otherwise, we have a responsibility to others, like it or not. Manufacturers have such a duty in particular. Don't want the responsibility, keep it low key and try not to promote it. Better still, if you want to paraglide (or hang glide) use the right equipment as been said already. It is when your kite is flying in a direction away from the tether or tow line. As the line tension increases so does the warping of the kite increasing the magnitude and force of the turn in that direction. The kite is literally pulled at high speed into the surface as a result likely independent of control inputs the kiter might make. This can happen at blinding speed, faster than most can react. Last edited by RickI; 09-25-2015 at 12:23 PM. Towing up to 150 ft., extreme right? No, not when compared to 1500 ft. on proper gear. To view it as otherwise is to get totally jacked by boosting a FIVE FOOT jump as compared to a fifty footer with kite gear. Fly for real or make due with serious limiting handicaps. It's all relative and worth thinking over. Looking at our fatalities, it is hard to dump all the dumb moves on kids. It seems that the opposite in years past was more the case. I was doing some pretty extreme stuff at 16, single tank bounce diving to 270 ft. to O2 toxicity in Cozumel and suffering my first minor DCS hit in the Bahamas on a 250 ft. dive the same year. My partners were very experienced adult commercial/scientific divers, not by accident however. Risky stuff, sure was but at least I tried my best to learn what it was all about, emergency procedures, physiology, deco theory, barotrauma symptoms, first aid and I tried to use the best available gear and techniques at the time. Primitive stuff to be sure in the early 70's but it was a priority. You know, like my life depended on it, which it did. The same can be said about kiting. Kids can be insightful and reasonably cautious if they are of a mind to and if they are guided in that direction. The same can be said of some but sadly not all adults. Life isn't about staying totally safe at all times and in all ways, at least not the way I like to live it and many others among us I suspect. I feel learn what you are getting into, how to handle yourself, train/prepare, gear up right and have at it within reasonable limits. Accidents will happen, people will get unlucky and sometimes folks will die. That is the way of things. It is the more obvious, readily avoidable, oft mistakenly titled "freak accidents" that I would like to see far fewer of. 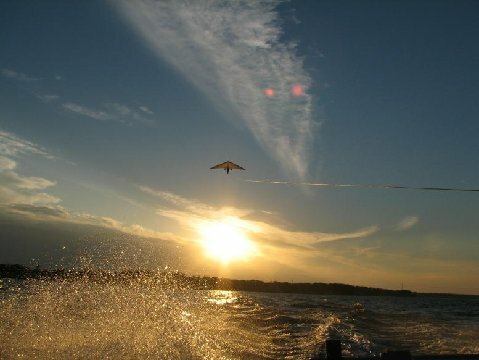 The most severe variety may be diminishing in conventional kiteboarding. Better for the potential victims, riders at large and our sport in general. I don't consider myself a hang gliding expert however doing boat towups for 14 years with proper gear and procedures things stick with you. I have been studying kiting failures and accidents far more in depth along with experiencing a number of my own incidents. From this experience I view towing up with kiting gear that I am currently familiar with as unduly hazardous by comparison to other established tow up mechanisms. I view it as serious, obvious and avoidable accidents waiting to happen, not as a whim or light conclusion but based upon quite a bit of time in the saddle. For what it is worth. The frequency of accidents as always will be driven by the number doing it along with other obvious factors. If few do it, there will be fewer accidents. If they keep it low key, there should be lessor fallout on our sport and the rest of us. Tow ups might be more feasible but the gear, safety systems and procedures have to evolve. high speed and force of impact. Here is an aerotow hang gliding clip. Once things when south you can see the glider heading off in the opposite direction of tow and as a result being pulled at greater force in the wrong direction. The glider eventually inverts but is landed safely thanks to the pilots skill and cool head. Last edited by RickI; 09-25-2015 at 12:33 PM. Just came across some towup video clips and prepared a sampler platter of towups gone wrong. There are a lot of things that can go wrong even with gear that is resistant to breakage, with safety systems and many years of development. I come from hang gliding and have yet to even try paragliding. Different bag of tricks in many ways. Reserve parachutes are essential safety items that have been with hang gliders and paragliders for a very long time. Too bad no one carries them towing up with kites. Of course at such low altitudes they might not open in time anyway. Lockout in a variety of ways. Lockout is a reality for anyone towing up, with a kite, glider, plane. Best to know what can cause it and how to try to avoid it (you think?). Good thing this guy is so stupid, otherwise he might have lost IQ points through multiple concussions. No proper training or gear for towing up. Just a wing, a prayer and no clue what he is getting into or risking. His glider is incredibly old, belongs in a museum. I almost bought one of these billow wing Regallo's myself, 30 years ago. Didn't have a car to drive to the LZ so passed, good thing. Another tow lockout, upside down and with poor resolution. Still, it gets the point across. Has anyone heard of weaklinks? Wind gradient and stalling one wing is discussed at length in gliding school. Of course they have a school. Like lockout it is good to know what the effects of wind gradient can be and how to try to avoid them. How about a broken line during one of these stalls? Most of theses failures were related to aerodynamic issues as opposed to gear failure. Gear failure can cause you to plummet to earth easily without any need to stall your wing. All these guys that plowed in are remarkably lucky. A fall from 12 ft. even less is enough to do serious injury on land. There have been cases of guys falling about 50 ft. into water, losing consciousness and drowning. Last edited by RickI; 07-01-2007 at 11:20 AM. Here's a towup gone "right," with the right gear, training, certification, weak links, reserve chute, instructor, wench, towline descent chute, safety knives and about 20 years of development worldwide. You can do this most weekends in Miami through http://www.miamihanggliding.com/ . Checkout this video. It imparts some of the sensations interestingly enough. This is only $95. USD. The price hasn't changed in almost 15 years! Best way to blow a C note that I know of, by far. I just came across some more clips. Folks will do things they don't properly understand and will suffer nasty consequences at times as a result. A potentially bad one over snow, another case of lockout on Facebook at the link above. They guy on the snowmobile knows where the gas is but that seems to be about it. An easy fatality but the guy hit some deep powder it seems, a good thing. GRAPHIC, disturbing imagery - A bad one with injuries during a stunt staged for a crowd. No helmet and no real idea how to approach a launch like this. Looks like a downwind launch in strong wind. The guys at the boat spent most of the time trying to figure out how to cleat a line, not good. I hope the guy lived and recovered as fully as can be hoped for. Last edited by RickI; 07-15-2014 at 08:52 AM. Some kiters use flimsy, non-redundant and not particularly stable kitesurfing gear over land for gliding, ridge soaring, even thermalling. This is a bad idea for many reasons, a key one among them is the lack of proper training that comes with USPGA paragliding certification. These programs were developed decades back initially with the USHGA after too many flyers were getting killed and maimed. Canopy flyers should train to be certified as paragliders before flying over land and then use that gear for it. It is purpose built, developed over decades and lots of injuries into the form it exists in today. Take something as simple as the universal release which has existed in paragliding and jumping for a very long time. Are we even close to a universal QR in kiting yet? You are right about the ability to break a few shroud lines before getting into serious trouble with a paragliding canopy. One should do you in very nicely with our flimsy, non-redundant kiting gear. If you need a hammer, use a hammer and don't bother trying to use a wine bottle. It might break and you could get badly cut. If you screw up any one of the important areas you could get hurt or even killed. How do kitesurfers learn this critical information using gear intended for water use over land? At best, they probably end up with a lot of holes in their understanding and skill base. This information has been lying around in flying schools for a long time built on other folks injuries, who would volunteer to repeat past mistakes like that which we have already learned from? I've been talking about lockout as it relates to kiteboarding kites either being tethered or towed for over a dozen years. Coming from hang gliding in the early 1990's I had a sharp and personal feeling for lockout and the violent feeling of helplessness and sudden injury it can signal. Once I started reading about kiters doing it and getting killed and maimed in various parts of the world, it seemed important to talk about it. Guys are still doing tow-ups and tethered man lifting today. That is human nature but I would like to think, not from lack of knowledge or awareness. So, look over this post and think about the consequences of using our kitesurfing gear in ways it was never intended to be used. overwhelmingly oppose that control slamming you into the surface.